Are you in a unique time in your life where you are wrestling to figure out a sense of purpose and direction in your life? How is having a sense of meaning important in our lives? How does meaning affect the way we think, live and connect with others? Participating in a Psycho-educational group will be the perfect opportunity for you to seek resolve with these deep questions. 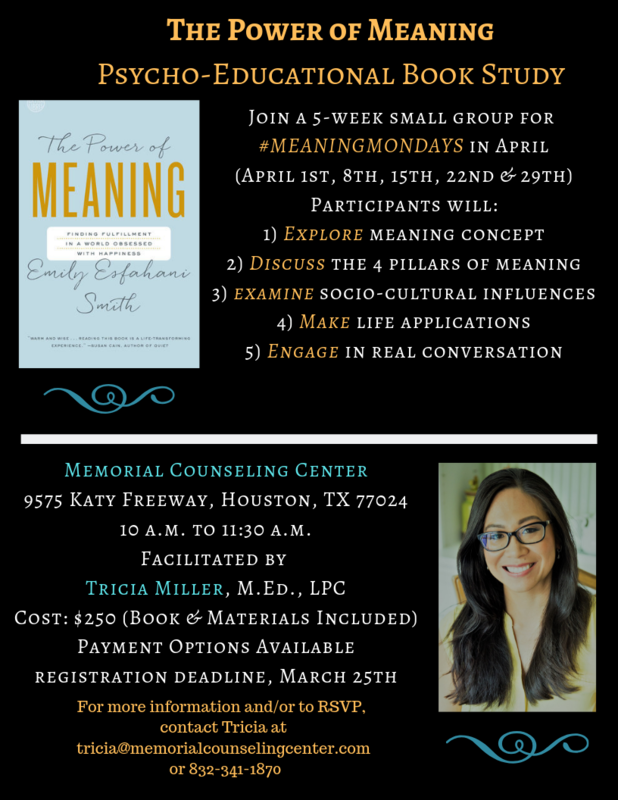 This April, I am excited to host and facilitate a 5-week small group book study on The Power of Meaning by Emily Esfahani Smith at my office at the Memorial Counseling Center. To get a feel of the content, check out the Smith's TedTalk, "There's More to Life Than Happiness." Psycho-educational groups combine pscyhotherapy with education and is designed to help participants with a particular issue. I'm excited to bring my experience in Education (10+ years experience) as well as my knowledge as a Therapist to this platform. If you think this topic resonates with your life right now, I would love to have you join our group. Please RSVP by March 25th. To sign up and/or for more information, please fill out the form below or contact me at tricia@memorialcounselingcenter.com. Thank you for your message and interest in The Power of Meaning Psycho-educational Book Study! I will get back with you within 24 hours!